It’s no secret that I love plants. I love crystals and animals too…but plants are my ‘thing’. I have a house full of oxygen giving plants. Obviously not in the bedrooms, as at night they give off carbon dioxide then, which is a waste product I don’t particularly want. So I made sure that it is full to the brim with crystals, candles and plants. It has beautiful midnight blue tiles on the walls. Plants are amazing transmuters of energy. They clean the air and give so much visual pleasure. Every time I climb into the bath and relax the plants join in the meditations. I have two Peace Lillies on either end of the bath and whenever I get in they touch my head or shoulders. There are two creepers making their way along the walls. I have plants in every nook and cranny of the bathroom to create the grotto that I dream of regularly. I love it. To be surrounded by nature. The elementals love being there too. Besides the two small windows, we have a huge window next to the shower cubicle that is frosted glass. I imagine that I have an incredible view out over a valley. It is my dream to have a bathroom in an outdoor grotto with a huge bath made of earth and crystals, surrounded by lush tropical plants. In fact it is my dream to have an earth house. 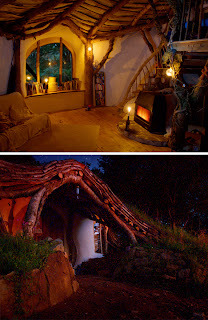 The whole house is surrounded by trees and we make our home amongst the huge roots of the trees with their permission. They surround us with their roots that are fashioned into rooms according to our needs and lovingly create steps up into their branches to a large branch that is like a deck. All done with mutual agreement. It is the kind of house that no-one knows is there until they stumble upon it by accident. The earth creates a winding footpath leading to the front door. I always think back to our last house in Cape Town. It was/is on a lake, facing a mountain. Wildlife, trees and water everywhere. We had to leave as we were becoming too complacent and comfortable. There is no growth in that. One day I will have done enough clearing to settle somewhere and create my dream home with Mother Earth's assistance. In the meanwhile I love and make the most of what I have now. I love that pic from South Africa. That hill ... wonderful. I love living near water too. That view in South Africa calls out unicorns to me. The Ochils... :-) there are some names that simply grab you, aren't there and this is one. Yes, there is a lot of unicorn energy there...and fairies. This is where I first 'saw' a water sprite. I have never had the pleasure of living near a waterfall, although when it rained we could see the water coming down the mountainside as little waterfalls. We have indeed been blessed with our vista. Even though I don't live near water, I can feel the water table underneath constantly moving.